Benton’s (Tennessee), Broadbent (Kentucky), Edwards’ (Virginia), Arkansas Peppered, and Nueske’s (Wisconsin). So, this is not actually a recipe from the Bacon book. Its a recipe from Cook’s Illustrated magazine (which they called French-style pot roast), which had the irresistible combination of using bacon in the recipe, and, calling for use of a large dutch oven (since I finally acquired an enameled dutch oven last week and was eager to use it). My husband and I made this dish together, which was helpful because there were lots of steps to follow. Not difficult, just involved. Which is why I call it weekend pot roast – I could only make it on a weekend. We started at 12:45, and we sat down to eat at 6:15. 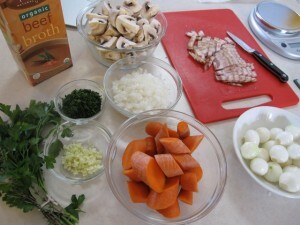 However a lot of that time was just cooking time. Here’s most of my ingredients, minus the wine and the roast. 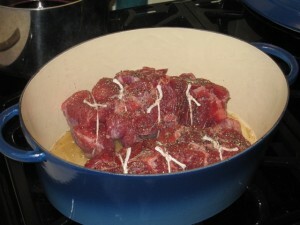 The main ingredient in pot roast, of course, was the 4lb boneless chuck eye roast. First I spent some time cutting out any large chunks of fat that were easily reachable, then salted it with a celtic sea salt and let it sit for an hour. Then patted it dry and tied it with butchers string. 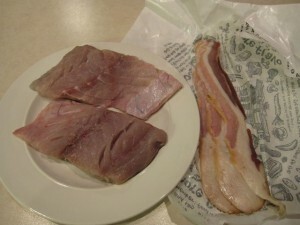 I used Vande Rose bacon, which I had never had before. Was nicely meaty and mild flavored. Those four slices resulted in a very nice amount of fat, more than I needed for browning the roast in. 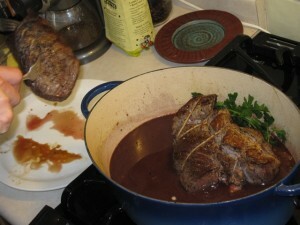 Here’s the roast when I first put it in the pot to brown. When it was browned on all sides I pulled the meat out of the pot. Then sauteed the diced onions and garlic, added the other broth ingredients (including a bottle of a Cotes du Rhone red wine, reduced down to 2 cups first, and the bacon goes back in too), and put the meat back in the pot, put the lid on of course, and baked it in the oven at 300 F for a couple hours. After 2 hours of cooking, you add the carrots and put it back in for another hour or so, and in the meantime you cook the pearl onions and mushrooms in a pan. 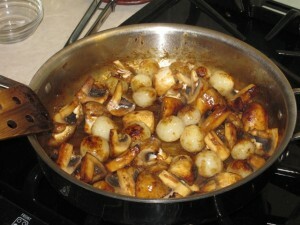 When the roast is done cooking, you pull the meat out of the sauce (temporarily), add the pearl onions and mushrooms and a little gelatin to the sauce to thicken it. Then you put it all in a serving dish. We served it with white rice and a side of steamed greens, was excellent. 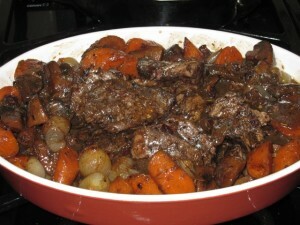 Very flavorful, and good textures too – not mushy, as pot roast and veggies can easily be! Nice. 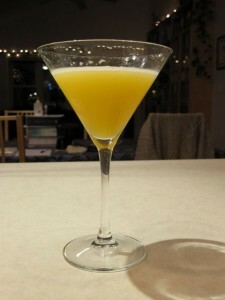 While enjoying my cocktail, I cooked 3 slices of Edwards bacon in my large iron skillet. I pulled them out when done, and chopped them up and set them aside. I left in all the bacon fat, and put in the two 1/2-pound fillets of bluefish, skin side down, and covered it with my round mesh splatter-protector. Bluefish is a fatty fish, so it did splutter a lot while cooking! I didn’t time it exactly, but the fish took a little longer to cook than I thought it would, over medium heat, maybe 10 minutes. 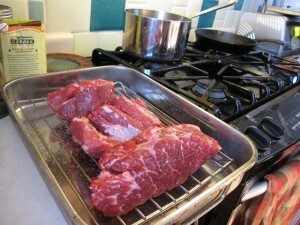 I think because the fillets were fairly thick on one end. I ended up flipping them more than once; I think I flipped it too early the first time. Resist the urge for early flipping. I tested them with a fork a few times and finally was satisfied that they were done. While the fish was cooking, I was also steaming some brussel sprouts I had bought the day before at the farmer’s market, from a local organic farm. They only needed about 5 minutes of steaming, and then I mixed them with a little sea salt, pepper, and balsamic vinegar and they were good to go. I warmed a couple plates in the oven, spread out some grits on each plate, and put a serving of brussels on the side, as well as some pomegranite seeds – we had a ripe one and I thought the seeds would look pretty with the brussels. 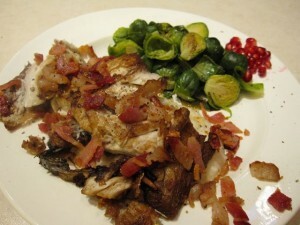 Then I put the fish down on top of the grits, sprinkled it with the chopped bacon, and sat down to a feast! Bluefish is one of my all-time favorite foods. But once you get off the East Coast it seems like hardly anyone knows it. This is a simple preparation, it has a great name, it’s pretty eye-catching on the plate and, most importantly, it tastes extremely terrifically good. I made it with the really superb, organic, stone-ground blue grits that we get from Glenn Roberts’ Anson Mills in South Carolina. Given that the old corn varieties ranged in color from white to red to yellow to blue and most everything in between (or even all on one cob—try Glenn’s multi-colored “speckled grits” too! ), blue grits really aren’t all that strange. It’ll mess up your all-blue color scheme, but this is also good with cooked greens on the side. To get back into the blue end of the spectrum you can follow with fresh blueberries and a dollop of fresh whipped cream (no bacon) for dessert! Since the cooking time is the most challenging element of this recipe, feel free to prepare a larger portion than you actually need and save some for later. Heat the water in a heavy four-quart stockpot. 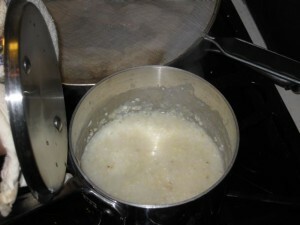 Start mixing in the grits while the water warms up, stirring regularly—I find it infinitely easier to get lump-free grits this way. Add salt and stir well. 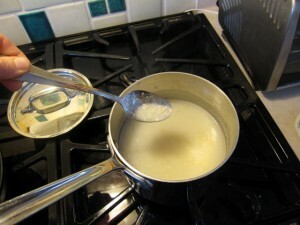 Bring to a boil, then reduce the heat as low as possible. Stir a few more times, cover and cook on low for as long as you can—a good 2 to 4 hours—the long, slow cooking releases the starches and makes the grits really creamy. Once you get them cooking there’s really nothing to do but stir every 15 minutes or so. 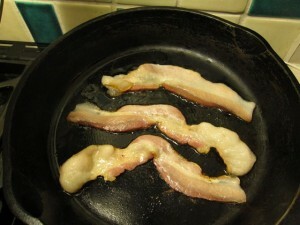 Fry the bacon in a heavy-bottomed skillet over moderate heat. 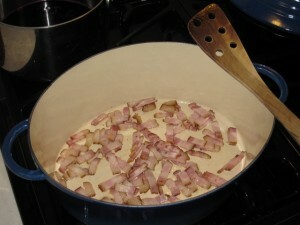 Remove the bacon from the pan and drain, leaving the fat in the pan. Add the fish to the still-hot bacon fat in the skillet, skin side down (I think the skin is the best part!). 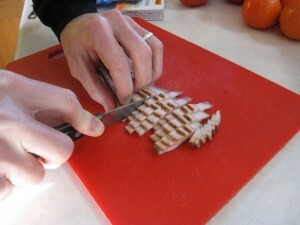 Cook the fish until the skin is browned, then flip and cook quickly on the other side. If you need more fat, add a glug from your reserves or use a bit of olive oil. 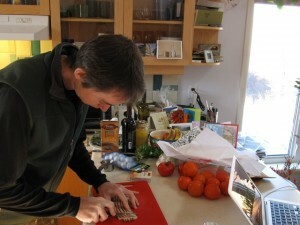 While the fish is cooking, chop the bacon coarsely and set aside. When the fish is almost done, set the grits into a couple of warm bowls. Place the fish on top, skin side down. Sprinkle the fat over the whole thing and top with salt, pepper and chopped bacon. Saturday January 16, 2010: a book signing at Omnivore Books, 6-7 pm. Please see their links for more information, hope to see you! Join Ari at a Bacon and Champagne Social! At 3CUPS cafe in Chapel Hill, NC, on December 9, 2009. Please see their web site for more details and contact 3CUPS if you’d like to attend, it promises to be a festive, and very flavorful, evening!